The following plant care guide is a work in progress. The emphasis is on indoor or houseplants but the basic principles apply to both indoor and outdoor plants growing in containers. I plan to add videos in the near future. In an effort to improve the clarity of this guide, it will be most helpful if you would make constructive suggestions or ask questions either by comment or email me at urbangreenscaper [AT] gmail.com. Thank you on behalf of other readers. It’s easy to understand why so many houseplants look unhealthy and why so many people feel they have a black thumb. The undeservedly popular drench and drain method of watering is tricky to learn because it’s all art rather than science. It’s based on feel and estimating rather than measurement. It might be okay for the greenhouse but not in your house where light is scarce and the environment sometimes harsh. Poking your forefinger in the soil to feel the soil moisture and using window direction to estimate the light level is hardly scientific and highly subject to error. For most of us, human judgment about measuring light and soil moisture is woefully inaccurate. Human judgment may work for plants in the sun when photosynthesis is at its peak but not in low light building interiors. The margin for error is quite small. What follows applies to any plant species whether grown for foliage or flowering decoration or for food production. The only difference in these categories is the level of light required, vegetables being at the top of the chart. Sub-tropical foliage plants require the least amount of light but even they will die without adequate light. Up is clearly better than down when it comes to watering plants in containers. That's true even for cactus plants. Consider watering your houseplants using the zone method in sub-irrigated planters instead of drain hole clay pots with saucers. Promise, I won't tell your friends that you stopped watering your houseplants by the "poke, pour and pray" method. How can they tell if you hide the pop bottle planters inside a clay pot, decorative cachepot or cover? 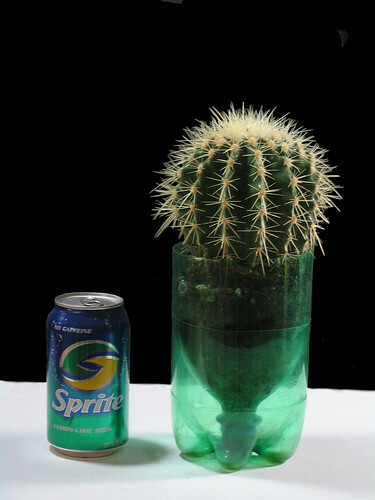 This cactus has been living in a sub-irrigated pop bottle planter since September 2007. It is now December 4, 2008 and it last received water (2 ounces) on October 20, 2008. That's all the water the plant wanted and that's all it has gotten. Try doing that with the drench and drain method. There is no need to add water this week. The watering history (weekly weight) of this plant clearly shows that it could be on a 2 week schedule. The root system continues to grow and expand. There are root tips now protruding from the neck into the reservoir. See the Flickr set for all of the prior photos. Or, see the prior posts here. Click on the photo for larger sizes on Flickr. Added 5 ounces after two weeks. It appears that based on history over the past weeks "the zone" for this plant is between 11 and 16 ounces. Plants like nothing better than adequate light, consistency and evenly moist soil. Measured sub-irrigation is a very simple and effective way to accomplish this. There is no need to add water this week. Measured sub-irrigation has demonstrated that this Dracaena Janet Craig 'Compacta' can easily go two weeks without adding water. How many houseplants are killed by over watering using imprecise drench and drain watering? The growers love it because they know you'll blame yourself and buy another one. Silly you. This photo is part of a Flickr set. See the history of this post here. Based on this weight of 11 ounces, I added 5 ounces to bring it back up to what appears to be it's ideal weight of 16 ounces. I can also see that the root system has grown since last week. Read more about this series of posts about watering in the zone. 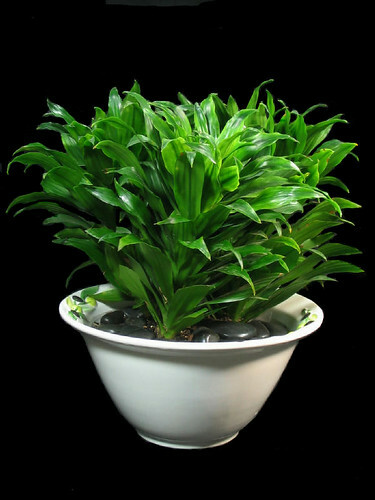 It is widely known that a Dracaena Janet Craig 'Compacta' like this does not use a lot of water. Few would predict, however, that it would use only 5 ounces of water in 2 weeks. Drench and drain top watering is simply a bad idea. It wastes water and shortens plant life. Unfortunately, most houseplant books and the USDA cooperative extension program preach it. You must have a drain hole in your planter sermons are all over the web. Some of this bad advice comes from ignorance and some from disingenuous sources with hidden agendas. In either case, the advice is incorrect and not in the public interest, particularly regarding personal food production. It weighed 16.1 ounces last week after adding 6 ounces. It used just 3 of them so it won't get more water until next week. The plant is definitely "in the zone" and I see more new roots forming. Stay tuned. To illustrate how little water sub-irrigated houseplants use in low light interiors, I'm tracking this Dracaena Janet Craig 'Compacta'. 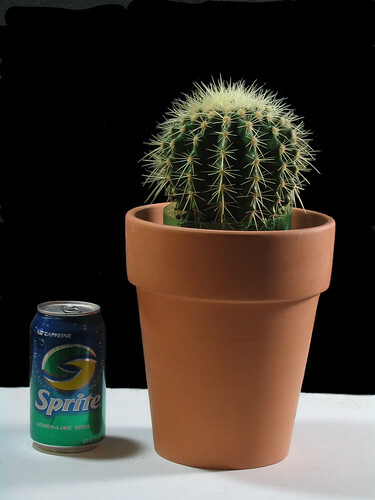 It was a new 4" plant potted into a 2-liter recycled pop bottle planter about 3 weeks ago. No additional water has been added to the plant since then. Going into week 4, it has used and/or evaporated only 8 ounces of water. Today I added 6 ounces, the first water added in 3 weeks. The range of ideal moisture "in the zone" for this plant is most likely between 10 and 16 ounces. Next Monday when the plant is weighed again we will know how much of the 6 ounces was used and that information will guide future watering. Two things to note, the water is fed to the plant from the bottom by capillary action (sub-irrigation). It goes directly to the roots. There is no way you can supply water to a container plant with this kind of precision by gravity feed top watering. Read more about watering in the zone. "Listen" to your plants with a scale. Instead of you telling your plants how much water they need, have them tell you precisely how much water they need.